Harith's Space! : The A380 is there.. finally! The A380 is there.. finally! Finally the Airbus A380 made the first commercial flight. 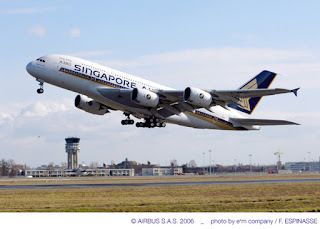 The first receiver of this gigantic aircraft was Singapore Airlines, and the flight was from Singapore to Sydney. I saw some nice videos on You Tube, the plane is amazing by all means!! I wish I was on that flight! Check out youtube for some videos. So far this airplane will fly in Singapore – Sydney route. Only few airports are ready for the A380. Having this huge plane on ground requires a lot of changes to the airports taxi ways and runways. The plane is also is predicted to fly in the signapore-heathrow route in early 2008. In the United States, very few airports are ready. As far as I know LAX (Los Angeles airport) is the only one that is ready. Surprisingly, the A380 is expected to have greater presence in airports in south-east Asia, such as Hong Kong, Tokyo, Singapore and Bangkok. Dubai is also expected to have great A380 presence. Do you know why? Because Emirates Airlines ordered 45 A380!!!! Emirates Airlines is expecting the first A380 in 2008. One of the expected routes is Duabi-JFK. I am looking forward to this flight, and I have to be on the first flight no matter what!! This is a video of the historical take off!